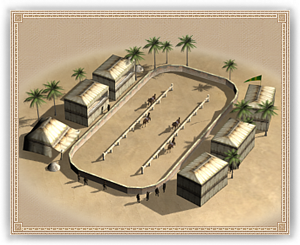 A Sultan's Race Track allows cavalry recruitment in a city, and the ability to stage races. It also improves public happiness. The love of the horse extends right through to the ruling class in Islam, and the Sultan’s Race Track is a place capable of staging races worthy of royalty. The track itself is not remarkable, but the quality of horses taking to the track truly is. This in turn leads to a better cut of cavalry unit that can be mustered in the city, and more enthralling races.